Not only was December industrial production an awful -0.4%, November was revised lower from -0.6% to -0.9%. Not to fear, economists blame the weather for much of the decline. The Econoday Consensus Estimates for industrial production and manufacturing were -0.2% and +0.0% respectively. The actual results were -0.4% and -0.1%. 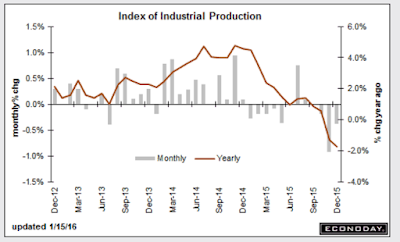 December was not a good month for the industrial economy as industrial production fell a sharper-than-expected 0.4 percent. Utility output, down 2.0 percent, declined for a third straight month reflecting unseasonably warm temperatures. Mining, reflecting low commodity prices and contraction in energy extraction, has also been week, down 0.8 percent for a fourth straight decline. Turning to manufacturing, which is the most important component in this report, production fell 0.1 percent for a second straight month (November revised downward from an initial no-change reading). Details on manufacturing include a second straight contraction for vehicles, down 1.7 percent following November's 1.5 percent decline. Weakness here, along with weakness in the motor vehicle component of this morning's retail sales report, will raise talk that the auto sector, which had been one of the highlights of the 2015 economy, may slow down in 2016, at least the early part of the year. Construction supplies are a positive, up 0.6 percent for the second strong showing in three months and confirming strength underway in data for construction spending. 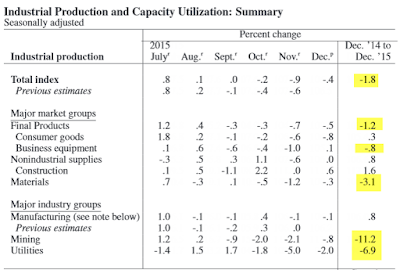 Capacity utilization fell 4 tenths from a downwardly revised November to 76.5 percent. A low utilization rate, which is running roughly 4 percentage points below its long-term average, holds down the cost of goods. Year-on-year rates confirm weakness, down 1.8 percent overall with utilities down 6.9 percent and mining down 11.2 percent. Manufacturing is in the plus column but it's nothing spectacular, at plus 0.8 percent. Making matters worse is a downward revision to November, now at minus 0.9 percent vs an initial decline of 0.6 percent. Looking at the annualized rate for the fourth quarter, industrial production fell 3.4 percent though manufacturing did increase but not much, up 0.5 percent. Weather factors are skewing utility output but otherwise, readings are fundamentally soft and reflect the downturn in global demand made more severe for U.S. producers by strength in the dollar. It appears the weather has been bad for 10 out of the last 12 months. 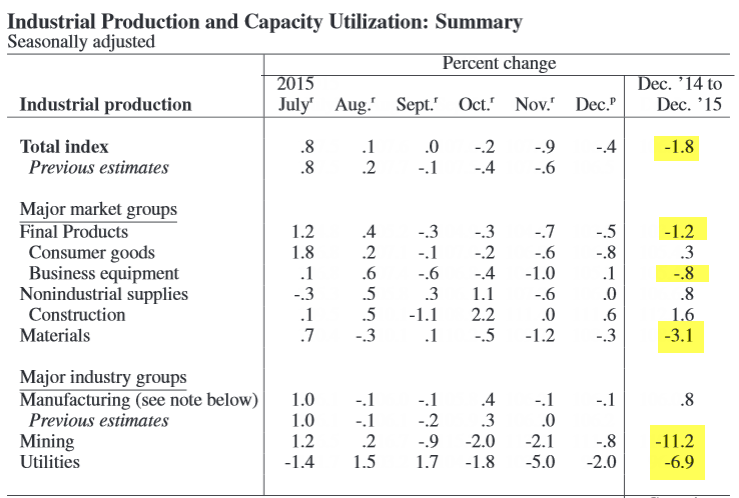 Above table from the Federal Reserve Industrial Production and Capacity Utilization Report. For most of 2015, I had been saying that auto sales were not sustainable. Over the past two months we started to see solid evidence of that viewpoint. I commented on varying auto reports, some good, some bad, on January 5, in December US New Car Sales "Down, Exceptionally Weak" Says Bloomberg; WSJ Says Up and Strong. Those saying December sales were strong failed to take into consideration the number of selling days. Looking ahead, manufacturers have spoken: December vehicle production was down 1.7 percent following November's 1.5 percent decline. The last five months for motor vehicles and parts production look like this: -5.1 August, +0.5% September, +1.1% October, -1.5% November, -1.7% December.